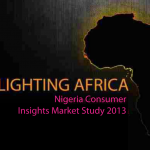 This study examined awareness of solar lighting in Nigeria, perceptions among key stakeholders and effective communication strategies. Nationally only 36% of households are connected to the national grid and power outages are routine. Few consumers are aware of solar lighting but those who are view its safety and durability as advantages compared to alternatives, such as kerosene and candles.